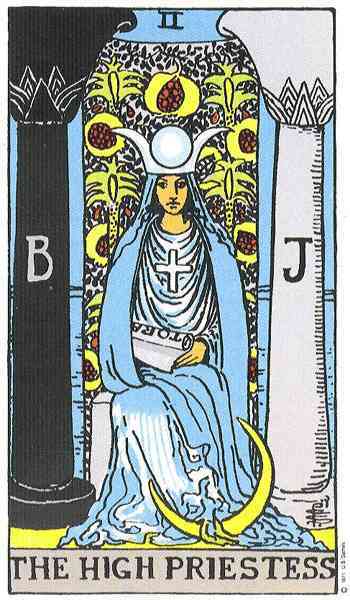 The card that I drew for today was the HIGH PRIESTESS: A pure, exalted and gracious influence. Education, knowledge, wisdom, and esoteric teachings. The forces of nature. Intuition, foresight, and spiritual revelation of the most mysterious and arcane sort. Continuing his journey, the Fool comes upon a beautiful and mysterious veiled lady enthroned between two pillars and illuminated by the moon. She is the opposite of the Magician, quiet where he was loquacious, still where he was in motion, sitting while he stood, shrouded in the night where he was out in the bright of day. Sensing that she is a great seer, the Fool lays out his sword, chalice, staff and pentacle before her. "The Magician showed me these, but now I'm in a quandary. There are so many things I could do with them. I can't decide." The High Priestess doesn't speak. Instead she hands him a pair of ancient scrolls. Seating himself at her feet, the Fool puts his decision-making on hold and reads by the light of her crescent moon. "I did not know any of this," says the Fool. The scrolls, like a secret manual, have given him insight into his new tools. "This information helps me to narrow things down, but I'm still afraid of making a wrong decision." The words come to him then, not from without but from within: "What do your instincts tell you?" The Fool reflects on that, and that's when he knows what he should do. Decision made, he rises to leave even though he suspects that the High Priestess has more secrets she could reveal to him--like what lies behind the pomegranate curtain. Right now, however, he is focused and ready to be on his way. Thanking the High Priestess, he heads off. But as he leaves he hears that inner voice, rising like the waters which spring and flow from beneath her throne: "We'll meet again...when you're ready to travel the most secret path of all." Once you have an idea, you also have decisions to make. The High Priestess holds scrolls of arcane information in her arms. In addition, the moon crown on her head as well as the crescent by her foot indicates her willingness to illuminate what you otherwise might not see about a job possibility, an investment, love, career, family, etc. But you need some alone time, some quiet time to meditate and reflect. This is what the card is all about. 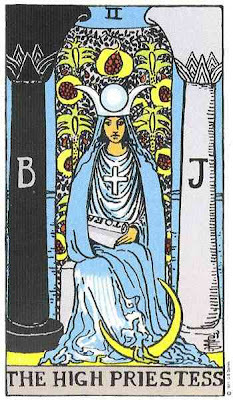 Seated between two pillars as between two choices, the High Priestess is not about making a decision so much as holding decision-making at bay while you take time to listen to your inner voice. She wants you to gain knowledge before you act: instinctual knowledge, supernatural knowledge, secret knowledge, self-knowledge. The High Priestess, however, goes beyond even that for those who seek more. Behind her throne is the curtain that leads to the deepest, most esoteric knowledge; the pomegranates that decorate it remind us of Persephone, who was taken down into the land of the dead, ate its fruit and became the only goddess allowed to travel to and from that strange land. The High Priestess is our guide to all that is mysterious and mystical.